It used to be that it was thought that it is love that makes the world go round. Others have demonstrated by their actions that they believe that it is money that makes the world go round. Now it is apparent that from the man in the street even to some of the world’s leaders they believe that it is compassion that prompts people to offer relief from suffering, whether mental or physical, to those who suffer. Do people suffer from hopeless sickness, offer them assisted suicide. Do others suffer but are incapable of acting offer them passive euthanasia. Are others a burden to their family or society, euthanize them. Do the divorced and ‘remarried’ suffer from not being able to receive Holy Communion, give it to them. Compassion is what makes the world go round, they believe. Catholics of course are taught that the theologicial virtues of Faith, Hope and Charity (love) are the foundation of living the Gospel. But Saint Paul reminds of that of the three the most important is love, without which all human acts are without value in the sight of God. But our secular society preaches that compassion for suffering people is the most important motivating force. It is truly a scandal that Catholic health care institutions should have joined forces with those who promote passive euthanasia under the guise of palliative care. In her 2005 book Terri’s Story: The Court Ordered Death of an American Woman, author Diana Lynn describes it as the “third path” to death, not wholly natural, not suicide, but something in between. During the last half of the 20th Century, medicine was changing. In 1987 Dr. Josefina Magno of Washington DC, and Dr. Gerald Holman, director of St. Anthony’s Hospice in Amarillo, Texas called a meeting of hospice physicians in Granby, CO to form what later became known as the American Academy for Hospice and Palliative Medicine (AAHPM), the professional organization for palliative physicians. In other words, Partnership for Caring would conduct a major public relations campaign to gain public support and a political mandate for their agenda. According to their 990 form they would hold presentations and training workshops, special events and provide members with information describing people’s options and rights with regard to life sustaining treatments. Many foundations funded this low profile euthanasia movement, but two stand out as the leaders. The Robert Wood Johnson Foundation funded research and infrastructure and George Soros’ Project on Death in America (PDIA) funded a cadre of professionals. In the last 20 years these two foundations have provided several hundred million dollars to advance THEIR VERSION OF PALLIATIVE CARE into our American health care system and worldwide. The Robert Wood Johnson Foundation celebrated its 40th anniversary last year. From its beginning, the Foundation acted like a quasi-university, allowing intellectuals to test ideas with the Foundation’s money. The Foundation is notorious for funding pilot projects so that it can later convince government to replicate them on a much grander scale. Starting in 1989, RWJ launched the six-year SUPPORT study of how 10,000 patients were cared for at the end of their lives. Dr. Joanne Lynn, who is currently Director of the Altarum Institute’s Center for Elder Care and Advanced Illness (CECAI), led the study. During this time, the Clinton attempt at health care reform had failed. Death and dying was a hot topic. Trumpeting the SUPPORT study in the news their message became: “The way we care for people who are dying and their families is dreadful. But with adequate communication we could change all that… just get people to fill out living wills and forego treatment.” But it didn’t work. Fewer than 20 percent of us signed living wills. Enter George Soros in the mid-90s. His 1994 speech at Columbia Presbyterian Medical Center announcing the formation of Project on Death in America included this summary statement: “The mission of the Project is to promote a better understanding of the experiences of dying and bereavement and by doing so help transform the culture surrounding death. In November of 1995 Soros called 20 foundations together who were committed to transforming the culture of dying. 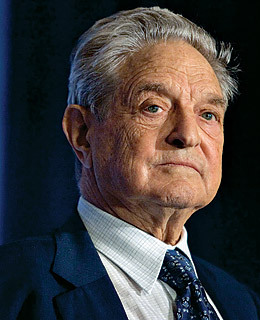 In addition to Soros’ Project on Death in America, his Open Society Institute and RWJ, the list of attendees include some people from many other foundations —- AARP, Commonwealth Fund, Greenwall Foundation, Mayday Fund and Kornfeld Foundation, Milbank Memorial Fund, Nathan Cummings Foundation, the Rockefeller Family Office, and the Gerbode Foundation. The member list of Catholic healthcare organizations working with the devil to bring us to an early demise keeps growing. This coalition below began in 1994 with seed money from George Soros of $50,000 and was called Committee on Care of the Dying with just three Catholic Healthcare organizations. Then it became Supportive Care of the Dying and now Supportive Care Coalition. Over the years it has included the Archdiocese of Philadelphia Healthcare System but they seem to have dropped out in the last few years. Our members serve patients across the continuum in 45 states with over 450 acute care hospitals and nearly 300 long-term care facilities. Additionally, many of our member organizations have hospices and home health services that serve the palliative care needs of their communities. This entry was posted in EUGENICS, EUTHANASIA, HEALTH CARE, JUSTICE, LIBERALISM, LIFE ISSUES, MEDIA BIAS, MEDICAL-MORAL PROBLEMS, MORAL RELATIVISM, NUTRITION AND HYDRATION, ORGAN DONATION, POLITICAL CORRECTNESS, RELATIVISM, SCIENCE AND ETHICS, SUICIDE, THE RIGHT TO LIFE, WITNESS TO THE TRUTH and tagged CATHOLIC HEALTH CARE SYSTEMS, Death With Dignity, EUTHANASIA, GEORGE SOROS, passive euthanasia, SUPPORTIVE CARE COALITION, THE THIRD PATH. Bookmark the permalink.